What can 5 Million Pounds buy you? A Diamond encrusted iPhone 4 of course! nd gadgets beyond belief, this time from renowned designer, Stuart Hughes. 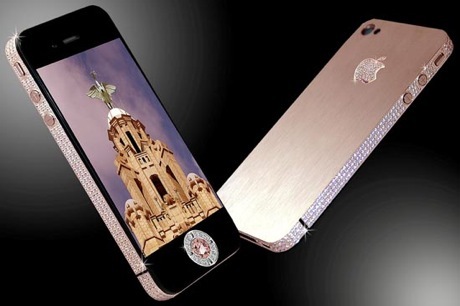 It comes in the form of an iPhone 4 with £ 5 Million worth diamonds encrusted all over it. kes this so special and extravagantly expensive are the 500 individual, flawless, 100 carat diamonds that line the sides of the device. The famous Apple logo on the back is in beautiful rose gold and has 53 additional diamonds to add to its splendour. As for the all important home button, it's made up of a beautiful pink diamond (7.4 carats). If that wasn't enough, you'll be glad to know that only 2 of these have been made so you can rest assured that you'll probably be the only one with this marvelous diamond encrusted iPhone 4 at your next party!